Maureen Sullivan was a 12-year old girl when her mother sent her to a convent in New Ross, Co Wexford, on the promise that she would receive an education from the Good Shepherd Sisters. Instead, she was committed to an often brutal and harsh regime inside a Magdalene laundry, a home run by nuns for fallen women on behalf of the Irish state. It was here that she endured years of physical and psychological abuse at the hands of nuns, who forced her to wash clothes, scrub floors, knit Aran sweaters and make rosary beads seven days a week. Separated from her family, Sullivan spent two years in New Ross, then further periods in a Magdelane laundry in Co Kildare, and another in Dublin city until she was eventually abandoned when she asked a Reverend Mother why she wasn’t being paid. She emerged from the laundry uneducated, unable to communicate properly and suffering from low self-esteem. 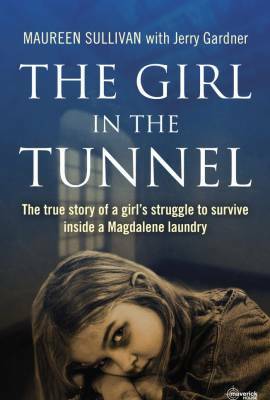 The Girl in the Tunnel, tells the story of Sullivan’s harrowing journey from the loneliness and despair of life in a Magdalene laundry to becoming a leading advocate for the women who survived the brutal and harsh system.